De Quervain’s Tendonitis is a condition caused by an inflammation of the tendons located at the thumb side of the wrist. Tendons are tissues that attach our muscles to our bones. They can become swollen and sore from over use. Traditionally, de Quervain’s Tendonitis was called “Washer Woman’s Syndrome.” This is because the repetitive hand movements used for wringing wet clothes-- thumb pinching, squeezing, and moving the wrist outwards towards the little finger, are the motions that can cause de Quervain’s Tendonitis. Two of the tendons that move our thumb are involved in de Quervain's Tendonitis. The tendons pass through a tunnel, called a tendon sheath, and connect two muscles from our forearm to our wrist. The two muscles are called the Extensor Pollicis Brevis and the Abductor Pollicis Longus. These muscles allow our thumbs to move upwards and away from the hand. We use these movements to pinch, grasp, or squeeze objects. These muscles also allow our hand to move towards the side of our little finger, such as when we wave from side to side. Doctors do not know what causes de Quervain’s Tendonitis. It may be produced by an irritation of the tendons at the base of the thumb. Repetitive thumb motions and wrist deviation, moving the wrist towards the side, can irritate the tendons when they move through the tendon sheath. Activities that require such motions include wringing laundry, gardening, and the awkward hand movements required for lifting and caring for a new infant. Overuse can cause the tendons to swell and accumulate fluid, resulting in a condition called Tendonitis. The lining of the tendon sheath can also become inflamed. This condition is called Tenosynovitis. Tendonitis and Tenosynovitis can occur independently or at the same time. Tissue swelling associated with metabolic disorders, such as diabetes and rheumatoid arthritis, may also cause de Quervain’s Tendonitis. It appears to have a tendency to develop during pregnancy or menopause, times when fluid may be retained. Doctors also believe that de Quervain’s Tendonitis may be caused by direct trauma to the wrist or by a sudden strain from lifting or unaccustomed exercise. The main symptom of de Quervain’s Tendonitis is pain at the thumb side of the wrist. You may also feel pain in your forearm. The pain can occur suddenly or gradually. 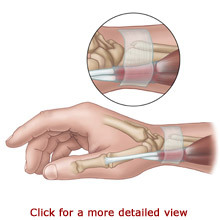 The pain will usually become worse when you use your thumb and wrist to perform grasping and pinching motions. If the nerve that lies on top of the tendon sheath is irritated, it can cause the back of your thumb and index finger to feel numb. De Quervain’s Tendonitis can also cause swelling at the wrist and thumb area. Some individuals develop a fluid-filled cyst in this region. You may hear crackling noises or feel a catch when you move your thumb. Some people have difficulty moving their thumb and wrist. Your doctor can diagnose de Quervain’s Tendonitis by examining your wrist and hand. Your doctor will also ask you about your symptoms and activities. The Finkelstein test is a common physical examination used to confirm a suspected case of de Quervain’s Tendonitis. The test is simple to perform. Your doctor will ask you to make a fist with your thumb tucked inside. Next, you will bend your wrist towards the little finger side of your hand. The test is positive if you feel pain at the base of your thumb. For some people, refraining from the activities that cause discomfort will make the symptoms go away on their own. Some cases of de Quervain’s Tendonitis respond to treatments that relieve pain and provide rest. Your doctor may recommend that you wear a splint to support and rest your joints. Anti-inflammatory medication may help reduce your pain and swelling. Sometimes doctors choose to inject cortisone into the tendon sheath. Surgery is recommended when symptoms persist and do not improve. The surgery is usually an outpatient procedure. You may be sedated for the surgery or the area will be numbed with regional or local anesthesia. 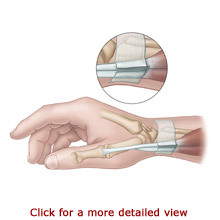 Your surgeon will make an opening in your wrist and make an incision in the sheath that covers the tendon. Your surgeon may also remove the swollen tissue in the sheath. This creates a larger space for the inflamed and swollen tendons to move in. Occasionally, an occupational therapist can help you gradually gain strength and movement while reducing discomfort and swelling. Recovery from de Quervain’s Tendonitis is very individualized. It depends on the type of treatment used and the extent of surgery. Your doctor will be able to tell you what to expect. Most individuals have very good results and make a full recovery. 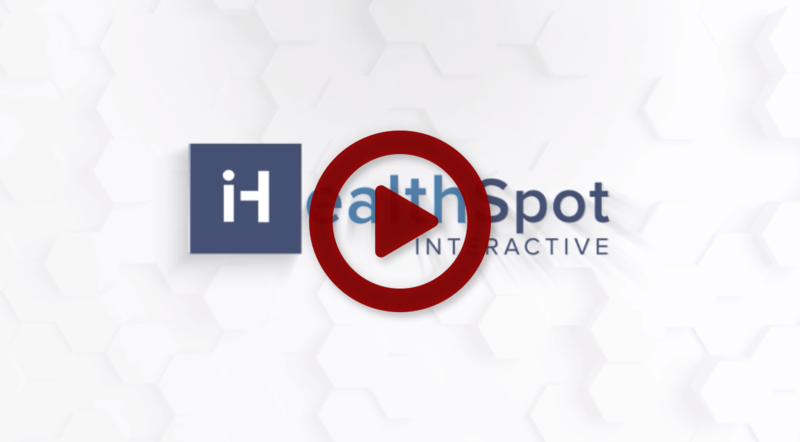 Learn about orthopedic conditions and treatments from A to Z in our interactive patient education library. © Conway Orthopaedic & Sports Medicine Clinic. All Rights Reserved. Conveniently located north of Little Rock, our board-certified orthopedic surgeons in Conway, Arkansas provide comprehensive care to patients of all ages in Faulkner County and throughout Central Arkansas. We offer hand surgery, wrist surgery, arm surgery, hip surgery, knee surgery, foot & ankle surgery, hip replacement, shoulder replacement, knee replacement, and other advanced orthopedic surgery. Our Conway Ortho doctors treat all types of bone and joint disorders including sprains and strains, fractures, tendonitis, arthritis, sports injuries, knee ligament tears, meniscal tears, rotator cuff tear, shoulder impingement, sprains and strains, tendonitis and bursitis, tennis elbow, golfer’s elbow, shin splints, Achilles tendon rupture, carpal tunnel syndrome, trigger finger, DeQuervain’s tendonitis, Dupuytren's contracture, ganglion cysts, flexor tendon, extensor tendon injuries, osteoarthritis. Conway Ortho Urgent Care Clinic is open Monday - Thursday 4:00pm - 8:00pm. No appointment necessary.